Guardians of the Galaxy Vol 2 doesn't always escape the trappings of an obligatory sequel, but the disarming shenanigans of its screwball superheroes coax you to stay hooked on to that feeling, promises Sukanya Verma. When a 'bunch of jackasses' stood 'in a circle' to emerge unlikely saviours of the cosmos three years ago, it marked a welcome relief from self-serious superheroes caught in an unchanging vortex of noisy valour and franchise fulfillment. Contrary to Marvel Cinematic Universe's more illustrious entities, the Guardians of the Galaxy did not carry any baggage of expectations and writer/director James Gunn ingeniously turned this obscurity into an opportunity of 'Ooga Chacka' proportions to have some good, old-fashioned fun. Gunn's frisky follow-up retains its predecessor's irresistible flippancy and zeal for a vigorous colour palette and retro soundtrack. But in the face of novelty wearing thin and a plot that looks at schmaltz as adventure, Guardians of the Galaxy Vol 2's intergalactic antics struggle to find a rhythm. Things kick off sure-footedly enough with Electric Light Orchestra's Mr Blue Sky extending its feel-good fervour to dote on a post-resurrection Groot's toddling imp while the rest of the oddball gang is busy clobbering away a monstrous octopus to its yellow goop conclusion. Dazzling in its CG sorcery and immersive 3D, the opening sequence alone is worth the price of admission. Regrettably, the banter-flavoured bonhomie of its offbeat quintet, which made the first Guardians of the Galaxy such a picnic, is cut down to stick in hokey family reunions and a caboodle of antagonists. Peter Quill (Chris Pratt), the winsome scamp who is more Walkman junkie than Star Lord, confronts the truth about his parentage, his sage green cohort Gamora (Zoe Saldana) gets a taste of sibling rivalry around ombre blue Nebula (Karen Williams). Numbskull alien warrior Drax (Dave Bautista) finds a kooky complement in a socially awkward empath named Mantis (Pom Klementief). 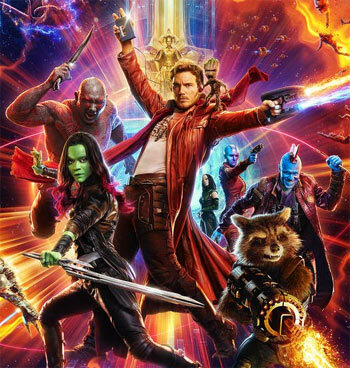 Without a doubt, Galaxy poster boys (voiced ever-so-delightfully by Vin Diesel and Bradley Cooper) Groot, the twig whose vocabulary is limited to three words but expressions range in thousand and Rocket Raccoon, a quip-ready, devil-may-care, furry portrait of insolence are still the brand's biggest attraction. If they don't get an independent story arc, it's probably because they sell enough toys already. And after witnessing Rocket's quick thinking in devising a trampoline-like effect to hurl his pursuers atop pine trees and Groot's child-like confusion in understanding the nitty-gritties of explosives, they are bound to sell some more. Rocket's high jinks spell trouble for his gang yet again as they incur the ire of an army of aureate Sovereigns led by their haughty leader Ayesha (Elizabeth Debicki evoking a Tilda Swinton) or outwit Taserface (a suitably overwrought Chris Sullivan) a gruff, ghastly space pirate and self-appointed replacement for Yondu (an excellent Michael Rooker) calling the shots among The Ravagers. Juxtaposed in these escapades is Kurt Russell as Ego combining charisma, cheek and campiness to play a highly fertile and fanciful planet. Quite a few friendly, famous faces show up fleetingly during the course of Vol 2's rambling narrative, but lack the wit to play on its pop-culture powered frivolity. Often it's what plagues this sequel about outer space misfits the most. Gunn nearly stifles his protagonist's sass and snark to harp on fathers and father figures, lengthily discuss a 1970s chartbuster and pay fitting but overlong farewells. At a running time of over two hours, with nearly half of it devoted to a tedious apocalyptic scenario and gratuitous explosions in outer space, the only reason to keep up with Vol 2's indulgent exercise in mayhem and mawkishness is the imagination it packs in. A riot of cosmic fireworks, a rainbow coloured pyre, Star Lord summoning a Pac-Man shaped defence, Yondu reprising his cool arrow trick to topple a host of opponents and a predominantly multihued cast extolling the virtues of make-up art reiterates Gunn's flair for visual pizzazz. Piggybacking on the first one's popularity, Guardians of the Galaxy Vol 2 doesn't always escape the trappings of an obligatory sequel, but the disarming shenanigans of its screwball superheroes coax you to stay hooked on to that feeling.